Woohoo! I'm going to try this asap! Ok, this I can probably drink :) thanks for sharing a new way to enjoy this! thanks lady! i'm a big acv believer but have been using it my face and haven't been able to drink it. i will definitely try this! You make it look really good! Do you find this just at the grocery store or a health foods store? Emily- Your local grocery store should have it. If for any reason they don't then a health food store would for sure! Would honey work instead of Stevia? Jessica- It is normal for your skin to be red after topical application, as long as it is not burning or stinging. As far as melasma and treatment goes, I will keep that in mind for an upcoming skin care post. Hmm I've always been so scared to try drinking apple cider vinegar but it has been reccommended to me so many times, I think now it is time to try!! YUM so trying this, thank you. Okay all of the reasons you gave sound perfect to me...I have such bad digestive issues...am looking for a good fix! I'm going to try this next time I get a cold. I never wanted to before because of the taste, but maybe this will help! 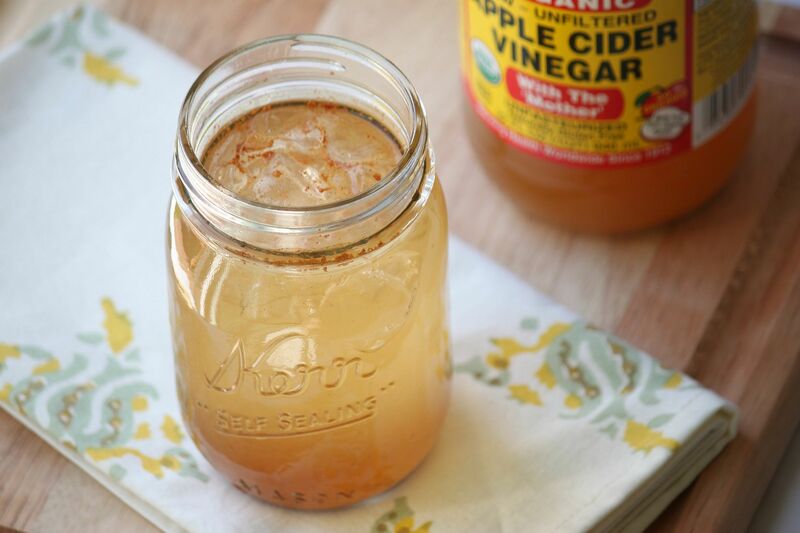 I love apple cider vinegar, but this looks especially good! Terrific, I still haven't gotten me and my hubby to drink it on a regualar basis but after reading your suggestion we have started using it when we feel a cold coming on! Maybe this little recipe will help us use it on a regular basis. oh how great!! i do mine with lemon juice & stevia and make kind of a lemonaid-y drink but i need to try this fabulous looking concoction! This sounds like something my MIL would do. She is always singing the praises of apple cider vinegar. I use it in salad dressing and it's delicious. Looks so good! Do you keep your ACV in the refrigerator? Even since your post about using it as a facial toner it has been under by bathroom sink, but I thought I heard once it should be stored in the refrigerator. I just bought a bottle of this stuff...Question - When you use it topically do you need to wash it off or will the smell disappear after a bit of time? Thanks for sharing this! I am impressed by all the great benefits from this, so nice to know! hmmm... I like this. I've heard of the benefits of apple cider vinegar before. I've always mixed a little with water, but I still find it to be too acidic. I'll try it. Thanks! Yummm! Looks like a super delicious drink! Thanks for posting the benefits of apple cider vinegar. my husband drinks 1 part apple juice 1 part grape juice 1 part acv every morning - it smells SO gross. I know acv has tons of benefits ... I am willing to give this version a shot!! As I have been chugging acv and water with my nose plugged. I couldn't wait to try this. While I still don't "love" it this version is much better. Thank you for sharing! I didn't have apple or grape juice on hand but I had Lorann candy flavoring oils in green apple flavor and it's like drinking apple pie! SO GOOD! Hey Lindsay! Just wanted to let you know that I tried this drink this past weekend...and LOVE IT. I feel so healthy and fabulous ;) I've been telling everyone about this new info (even linked it to my blog today). Thanks again for sharing! Lindsay-I'm also a type 1 diabetic and just curious about the benefits you've seen from taking acv in regards to your blood sugar control. Love your blog, thanks! I just tried some. I used honey as sweetener. It was very refreshing - I felt really good after drinking it, although I found the taste a little tangy. :) Thanks for posting! onmohawkdrive.com- I notice that when I drink it with a meal my post meal blood sugar is lower compared to when I do not. My A1C is also a 5.8 currently, which is the best it has ever been. Not saying that is all related to ACV but I have noticed so many positive benefits since I have started drinking it on a daily basis. When I married my husband, 18 years ago, he had me drink acv for stomach aches that I frequently got back then. It always worked but never tasted good. My husband is going to love this recipe and I bet I'll be making it tomorrow for all of us to try. Thanks. You mentioned lower #'s after a meal when you drink it with a meal. (I'm T1 also). Do you ever try it first thing in the morning on an empty stomach, sipping through the day, or always with a meal? I've been on a morning kick (on an empty stomach, first thing) of hot lemon, ginger, cayenne tea. It's been great for my digestion and making me VERY "regular". Thanks for always sharing such great advice! MUCH MORE DRINKABLE!!! I was plugging my nose and chugging it down before LOL...now it's actually an enjoyable beverage! I think the cinnamon really helped which I would have never thought of before. Thanks Lindsay!! Ihave been drinking raw organic apple cider vinegar by its self but this sounds much better so I am going to try it in the morning. Thanks! This is surprisingly delicious! Reminiscent of a tart apple pie! I can picture sipping this on the porch come summer. Very refreshing. Bet it would be great with sparkling mineral water. And if it will give me a little help with my blood sugar, than all the better! Thanks Lindsay! I can't thank you enough for this post!!! i've been playing with it ever since your first one and this sounds just so yummy! It's been getting me through the cold and flu season! you are awesome!! Thanks! Lindsay - How many times a day should you drink it for the best benefits? Thanks!! I know you posted this as a drink but do you think you could put ACV in tea with some stevia? Ness- of course you could! :) I make a hot tea concoction whenever I have a sore throat. I use water, ACV, lemon and sometimes a little honey. is there a certain time of day that you drink this? is it before meals or at bed time? Lindsay- I started drinking this a week ago and I wanted to share that I really like it. I thought it would be terrible, but it's actually just tangy. I have hypoglycemia and cinnamon is also supposed to help regulate blood sugar as well. It seems to help me feel refreshed, enegerized and I've noticed I haven't had too many "crashes," where my blood sugar gets really low and I feel awful. I plan to keep it up. Thanks! i can't wait to try this! i always drop a little in my green tea, but i have to overcompensate with so much honey to combat the bitterness. Tried this, this AM. Wonderful. My grandmother has always made M the acv with hot water honey got colds. I felt a cold this morning DVD started drinking. How often do you recommend daily? This is good! I was looking for a way to have this daily. Thanks for making it easy! I've been wanted to do a daily dose of ACV for a while (had it in my fridge and everything, used it for salad dressing in the meantime). I just couldn't get myself to do it. I tried this recipe with 3 slight modifications and it is delish! - So far, I've only made it with WG, but think it will be über fab with apple! - If you get organic, pure stevia, it comes with a teeny tiny scoop. Maybe a 1/16 of a tsp? That's all you really need. - Raw, local honey has a ton of benefits and I love the taste. The first time I tried it, I could only drink 1/2 of it. It was good, but very tangy and took some time to get used to it. I finished the rest the next day. I then skipped a day and found myself CRAVING it on the 4th day (today). I drank the whole thing, although in two separate servings. I think this is going to be my go-to wake-up beverage ... first thing, before eating. Maybe followed by some organic steel cut oats? I tried this and to me, all I could taste was the bitterness of the vinegar. It seems like it needs something else to mask the bitter taste. I just made this and really like it. I did, however, add a little more apple cider to the mix to help with the burn of the ACV and I think next time I will put the dry ingredients first, then add the liquids. I had added the cinnamon last and it did not dissolve very well and I had a this powdery layer on top. But after some thorough mixing, it was quite good! I just tried this and it was surprisingly delicious! I stuck in the freezer for 10 minutes, it was so refreshing! you may have answered this, but how many times a day should one be drinking this? & is 2 tbs a day enough to have some kind if effect? This sounds like a winner! And so great that it has cinnamon in it, which is also known to assist with keeping blood sugar levels even. Definitely going to try this! Just tried this with cranberry juice instead (it's all we had) and it was delicious. Thanks for the recipe! Great idea! I too swear by ACV. I used it when I had shingles. It was the only thing that worked. Just dabbed it on with cotton balls several times a day. Also works for cold sores, and skin blemishes. I've heard that when drinking ACV you should use a straw to prevent the ACV from effecting your teeth. Do you know if there is some truth to this? Great post! thanks! Can this be done with a different sweetener than the stevia? Thanks for the recipe! I tried it this morning and it was yumo! I ran short of juice so I substituted for lime juice. Excellent! Tried this and love it! Thank you for the info! Thank you for the recipe. I tried this today with grape juice and a few drops of non-alcohol stevia. This will become a daily drink for me. I doubled the recipe today using Truvia and added 2 tbsp local honey. LOVED it. Even got the hubby to drink it - he LOVED it and asked me to make sure to make him some when I make mine. Next time, I'll forego the Truvia (is't pricey) and see how it is with the honey alone for sweetening. Question - we drank a small juice glass of this wonderful elixir. Is that too much? How often should we use it? Is raw apple cider vinegar the same as just apple cider vinegar?? Do you have to use "raw"??? And along with what others said, how much of it do you need to drink a day to have it effective?? Doe it really help with weight??????? They make ACV tablets which require just as much water w/o that awful taste. I've been taking them for a week. I can't stomach the taste of it. how come when i put the cinammon in it just sits on top and doesn't mix in? I tried this. Well it was a bit different. I used 2 tbs of lemon juice instead of apple or grape. It did a good job of covering up the apple cider vinegar flavor. And then I used 1tbs of raw sugar (ground up). It is pretty tart, next time I will use only one tbs of lemon juice. FANTASTIC!!! Thank you for posting. This is the first recipe I have tried and actually liked! I used agave syrup just because I had it on hand and used fresh apple juice since I juice a lot. Wow! passing this along to all my other ACV using friends! Can you make up a batch and store in a pitcher for a few days so you don't have to make a glass ata a time? I don't know if you know this, but raw honey has a lot of health benefits. You can add that instead of stevia and juice. Is this something that you can sip on throughout the day, or should you just limit yourself to once a day? You can drink this as much as you want. 3 tbs per day is what is recommended though. It also does not matter what time of day you drink this for those of you who were wondering. It is whenever you want! Is it safe during pregnancy? Im 32 weeks pregnant and the benefits of this sounds like it can help me out in MANY ways. Thanks! I really love this with pineapple juice! I have always known of the many benefits of apple cider vinegar, but I cannot stand the taste of it. I used to mix it with cranberry juice and hold my nose, and gulp quickly; but I came to dread it and stopped drinking it altogether. I was so thrilled to come across this post! Thank you so much, I can't wait to try this! I actually had a chiropractor give me a recipe very similar when I was 15 years old to help with my cramps. I am now 37 and am here to tell you it works. While I don't have to deal with the cramps anymore I still drink this for the "gastro" benefits. I believe everyone can benefit from this recipe. I just tried this and, although I had no apple or grape juice or stevia, I did have sugar free cranberry juice and truvia which is what I used as substitutions and it was fabulous!! I've had that ACV in my cupboard for a month because of what I've heard about it's benefits but have yet to find anything that was drinkable without having to plug my nose...till now!! I'm so happy, thanks for the post!! Just a quick question...is this dose of 2 TB of ACV a sufficient amount to really see results? Just drink this once a day? I have severe gastro issues with heartburn and GERD being my most problematic and would love nothing more than to be able to cut down on the medication I'm on, if not, be done with it all together. Hi, just made this w/ a twist & love it!Out of apple & grape juice(want to try that sometime! )so just used fresh lemon juice & ginger powder.So refreshing!Thank you! Awesome! been drinking acv regularly but it has been hard to get it down without gagging lol. I am going to try this asap. thanks!!!
? How much do you drink? Do you drink this everyday? Is there a better time to drink morning or evening? You can drink this as much as you want. 3 tbs per day is what is recommended though. It also does not matter what time of day you drink this for those of you who were wondering. It is whenever you want! And sure you can make a big batch if you want. Sorry I am unaware if this helps lower blood pressure. Can you use regular sugar? Or does the defeat the purpose? Rhonda- using sugar is not recommended. Yes, it would defeat the health benefits. I drink acv in mornings in my OJ. I've also tried apple juice and Cran-apple. You cant tell that the acv is in it when you mix it with them. But I rather OJ with acv. I will try this too. I am always looking for a way to add something to my water. Can you drink this while pregnant? My honey suffers from Acid Reflux and has been scoped with not conclusive results. He pops tumms like candy and also takes Nexium. I saw this and thought we should give it a try.. So this morning I made some and we both thought it was pretty good. He said he is willing to try anything.. I found a green smoothy recipe on Pintrest that is helpfful in weight loss and although I could use some hep in that department, I thought the smoothy would be great just to get my daily fruits and veggies in.. I love the refreshing drink in the morning.. I will keep you updated in a week or so to let you know if this has made a difference with my honey... Thanks ! ! ! Sorry meant to say that I combine this recipe with my green smoothy and it tastes great! ! Very refreshing ! ! ! Can you drink this warm? It says cold filtered. I wash my hair with apple cider vinegar, works wonders and once in a while condition with coconut oil. I started this while cleansing and loved it so much, I have continued. Better than any expensive shampoo. thanks! I am going to try to do this daily. Reminds me of a mild kombucha. Tried this tonight. Used stevia in the raw (2-1g packets) and organic 100% juice grape juice. Was still pretty tart but i'm sure much tastier than the raw cider vinegar alone! Overall good stuff! I will be trying it again! I tried this with grape juice and it was delicious! I will probably use less stevia next time...for me stevia goes a long way, but it is a great balance and works well with apple cider vinegar. My new favorite way to incorporate apple cider vinegar into my daily habits :) thank you! What about using Agave instead of the stevia? This sounds great..I will definitely try this. two quick questions tho, what is Stevia? and Where can I find this??? I love this post! My grandmother healed almost everything with ACV, honey, or garlic. It works for us too! I have acid reflux disease and I regularly drink organic AVC (fights fire with fire)and it works so much better than OTC meds. I followed the recipe with white grape juice, honey, and my wonderful Vietnamese cinnamon. Delish! I have been using Pure Cinnamon Extract in coffe and drinks instad of the powder cinnamon and works great! I like it! I was totally no convinced. I use a little local honey in place of the stevia, but that's the only change I made. (I just don't have stevia.). I had to gag this down and did not love it! Y'all can take my opinion with a grain of salt though seeing as this is my first time tasting ACV. I think a hot version with honey and cinnamon would suit me better. I really hope this stuff helps with the lovely side effects of pregnancy! Well, my DH became self-employed this year and we became the proud owners of our own crappy health insurance policy. I feel a sinus infection coming on, so i am trying to test out natural remedies and this will be my first! I made this minus the apple juice b/c my kids drank it all and I used local honey instead of stevia as I have been hearing many benefits of local Honey. Hopefully it works and, if it does, I can get my DH to try it. He gets a couple sinus infections every winter. Wish me luck!! Yum, this was good! Finally I can enjoy drinking apple cider vinegar without puckering up :-x I dont use stevia and I didn't have agave on hand so I used a tsp of honey and this was a delight to chug down :-) thanks for the recipe, I think the cinnamon makes all the difference, to better health, cheers! I am 32 weeks pregnant and can NOT get rid of my heartburn for the life of me! So I came across this on Pinterest and thought I would try it... Though, to be honest, I was hesitant about drinking the apple cider vinegar. But another day of waking up at 4:30 am from heartburn was all I needed to motivate me. I just made me a glass and am drinking it now. It tastes kind of like lemon and apple infused water. Now let's see if it cures this heartburn! WOW!! this recipe is genius girlfriend! I used orange juice because that was all we had in the house, but I can't believe how delicious this is! I used to mix apple cider vinegar in a water bottle with water and a crystal light packet but I would still get the vinegar aftertaste. This has blown my mind lol! I will def be able to drink my apple cider vinegar on a daily basis now, thanks so much for sharing! I wonder if adding just a pinch of baking soda like they use in sweet tea to get rid of some of the bitterness, would work here? I have been shooting the ACV straight, but this sounds so much more enjoyable LOL. Gonna try it today! If you do just 1T ACV and the rest 100% Welch's purple grape juice (60z glass), you can hardly taste the ACV. Sounds good- I mixed up a batch. How much of this do you drink a day? -It is safe to drink while pregnant. -You can drink this as much as you want. 3 tbs per day is what is recommended though. It also does not matter what time of day you drink this for those of you who were wondering. It is whenever you want! Can you use agave nectar instead of honey or sugar? This recipe does not contain sugar, but you could use agave nectar if you want. I have been drinking Raw Apple Cider Vinegar for some time for arthritis. sometimes I add Honey. I make a 1/2 gallon and drink a shot each day. Honestly have to say without a doubt the added benefits you just listed now make sense to as I have noticed lots of changes in my body..all for the best. My cinnamon didn't disolve, and it wasn't very sweet, but I will drink it for the binefits. I add a lil more sugar and a lil more grape juice. Tried this recipe and love it! I just want to remind everyone when using juice to flavor, read the lable and make sure it doesn't contain High Fructose Corn Syrup. If you don't know the dangers of HFCS research it on google. I mix this with organic honey and water..nothing else..I have stopped taking meds for heartburn all together and it helps for weight loss as it burns fat..it does work and you don't have to add the other things..just the organic raw vinegar..organic raw honey and 8 oz of water..drink up..you'll be glad you did!! I just throw two tablespoons of ACV in apple cider, and is great. I have suffered from GERD for over 13 years, medication only masked the problem and upon stopping meds., the GERD only became worse. Organic ACV has been the only thing to extinguish my chest and throat "fire"! I drink Organic ACV daily by adding a splash to my morning cup of green tea and sweeten with raw honey. If I ever feel the slightest little flame in my chest caused by something I ate (onions cause a flare up for me), I simply pour a tablespoon and drink it strait up. My little flame is gone within minutes! It can be an acquired taste, so if you don't like it, start out small by adding a splash to your drinks here and there. You will eventually get used to it and like it! CAN I ASK WHAT THE CINNAMON IS FOR? I AM ALLERGIC TO IT SO BEFORE I PUT IT IN I WOULD LIKE TO KNOW IF ITS JUST FOR TASTE OR A REAL PURPOSE. Where can i find raw acv besides online? i do not have a whole foods nearby..
Is the Stieva necessary? I don't like anything sweet. It was terrible :( I had previously tried mixing the acv in with just juice and that was awful, this was even worse, it doesn't mask the taste at all. I'll be searching for other ways to make it palatable. So far nothing has worked for me. @ Anonymous above, try putting it in lemon zinger tea. I wouldn't bother with organic anything if you're adding grapes...unless you break the bank for organic & non gmo. I can't wait to try it with apple juice! Thanks! If you don't have a whole foods try GNC or independent health food stores. Some chiroparctors and alternative medicine doctors also sell it at their offices. I'm over 4 hours from the closest Whole Foods etc and I've seen braggs acv at all 4 places here! Oh how I love this! I just found this, just made this (after obtaining the ingredients)and it's delicious! :) My cinnamon didn't dissolve 100% but I'm not gonna lie, I like taking a drink and having a little burst of cinnamon in my mouth. I love the spicy yet sweetness of this. I'm currently dealing with a sinus infection and I'm hoping this will help! Thanks so much!! is this ok to drink when pregnant? I am a big believer in apple cider vinegar and can't wait to try this recipe...thanks so much for sharing! I look forward to stopping back in and reading through all of the comments. Does it need to be kept in the fridge? I didn't add the juice or sweetener, but the little bit of cinnamon made a big difference to me! I want to get some local honey at the farmer's market to add! I've never tried doing this, but someone asked about the ground cinnamon not mixing in, what if you made a pitcher of it in the refrigerator and stuck a couple cinnamon sticks in it to flavor the water/acv? In theory it sounds good, anways :). I actually put about 1 or 2 TBS of ACV in my daily soup. I eat bone/meat broth every day. It helps my digestion for sure and I read somewhere that ACV helps balance the body's PH. Can u drink it by itself? I was just wondering about the dosage. I know you addressed it earlier, but to be clear. Do you drink 2-3tbs of ACV a day, or 2-3tbs of the drink mixture a day? Just tried this last night, used some raw honey and some stevia - I didn't have any juice so i chopped up an apple and let it soak. Next time I would definitely use a cinnamon stick to flavor instead of the powder! But I was out. A cinnamon stick works really well to flavor water so I am sure it would work for this too - and it only needs about 10 minutes soak to really get a good flavor going. I think I either need more sweetener or to use actual juice next time, its a bit off putting/strong of the vinegar still for me at this point, though I will drink it anyways! Maybe it will grow on me! @Jessica I had eczema on my face for a long time and took medicine and cream and it only made it worse. When I started using ACV my face would get extremely red, worse than how it looked from the eczema, for like 20-30 minute and then go away. I noticed within a week of using it though, but face was completely cleared up. No more eczema! yay! And now my face is a little more used to it, it doesn't get as red or stay red for as long. Also, remember to water it down, I usually do half and half. GO ACV! I have been drinking this for a week. It does not taste good, but I CRAVE IT. I'm starting to drink 2 glasses of it. Whatever is in it, my body needs it. I"m 14 weeks pregnant, and it has stopped the reflux and the pregnancy burps. I have tried GNC during my gym going days and I find them to be the best in the world's best preworkout supplement. But nothing beats whole food that of which I am trying to get into. Does the water matter? Why the filtered water? I have been drinking raw apple cider warm with a splash of water and a tsp of honey when I am coming down with a cold or flu. But this I tried and love it! I can drink this everyday! I put it in a mason jar with ice and shook it up to get the cinnamon to mix and to make it ice cold. Thank you for sharing this! Hi Lindsay! Thanks for sharing this recipe! I've been mixing a teaspoon of ACV, a teaspoon of honey, (ours), a half teaspoon of minced garlic, a pinch of Real Salt, and taking this every couple of hours for a bad head cold. I have seen tremendous improvement; and actually have become addicted to the taste! It's delicious! Blessings from Bama! I made this tonight. Used juice from a lemon instead of the apple & raw honey instead of stevia because I didn't have those. Not too bad. i'm so excited to try this. I've been on the hunt for raw ACV for a long time now and finally found it the other day and jumped on it. I'm going to see if I can my bf to drink this along with me. Someone asked but I didn't see your answer yet, does it matter if the water is unfiltered? There's obviously a lot of variations for this, but the water is the only thing I didn't see anyone say they changed. Emily Grapes- I do suggest using filtered water. Do you have a Britta? Tap water is full of funky things and it kind of defeats the purpose of this healthy elixir if you use tap water. Let me know what you think if you try it! Back some time ago, they sold something called "Jogging in a Jug". It was apple cider vinegar, grape juice and apple juice. I made some at home 'to taste'. You can adjust the other juices to make it sweeter. I'm going to make your elixir but use raw, local honey as the sweetener. Good for what ails you. What is the benefit difference of using ACV to just using lemon juice? I use both combined with raw honey, garlic juice, ginger juice. Just curious. Love your helpful blog! I take a couple shots of ACV followed immediately by a 1/2 tsp of honey. That works somewhat. I'm also going to try this. BTW - I also like a vinegar base for salads, so I have replaced regular vinegar (too acidic) with ACV (not acidic). It taste quite good on salads, and doesn't take much (if to stronger for you dilute slightly). Many years ago, some folks on farms would drink this without the fruit juice instead of lemonade when they came in from the fields. Of course, there was no fltered water, either, and I'm not sure if they did it for its health benefits or because they couldn't afford lemons. There was a name for it which I am not quite sure about, pronounced something like Switzzle or shwitzle. A word of caution: Sharp vinegar sipped directly can cause extrememly dangerous choking. Keep away from children. Always dilute in some manner. This recipe is one of many excellent ways to use vinegar for health. would this have the same health benefits and Kombucha tea? ACV can be bought online from Amazon if you cannot find it locally. I love the recipe but how do you get the cinnamon to disolve? Aaballi- the best way to get the cinnamon to dissolve more (it will not dissolve completely) is to add it and stir it up really good before you add the ice. I made up a batch of this tonight, and I accidentally put a whole tsp in and it was too much! I will make again with the 1/2 this time. Thank you, so much for this recipe. I made this tonight and it IS actually good!! I have been trying to drink/eat ACV for a variety of health reasons, but aside from adding it to salad, I have had a hard time stomaching the taste. I tried this recipe and I can drink this with out getting sick to my stomach. Thank you for posting this recipe, it really does taste good. Lindsay, I have the same question as another poster.....do you mean the recommended dose is 3Tbs of the apple cider vinegar per day? or do you mean 3Tbs of the mixture once it's all put together? I'm assuming 3TBS of the ACV but want to make sure. Thanks!!! I use raw local honey instead of stevia. Local honey helps with allergies you may have because it is created with the pollens and such in your local area, so it immunizes you against the things you are allergic to most. Super benefits! My husband came home with the flu. My daughter and I started taking a spoonful of honey at the first sign of a sore throat and didn't get sick. My other daughter refused the honey and got sick. Is this a "one of these a day" thing or a "drink with your meals" type thing? I found this on Pintrest and started drinking a variation (3tbs of organic apple juice, 1 package of Trivia, and 2c of water) last Saturday. I have already noticed a decrease in my chronic heartburn. I mixed it up. Do I drink it all at once, and how often do I drink it? upon my first sip it's not too bad taste like an apple pie in a cup with a slight bitter after taste. Oh and when is best to drink it, before bed, early morning, with meals?? I made the mistake of drinking just water and apple cider vinegar the other day. YUCK! So when I found your recipe on Pinterest, I had to try it. I could not find the stevia in my home so I made your recipe without it and WOW it was really good! I do not like cinnamon in drinks and was worried when it just floated on the top but it added a nice flavor and if you continue to stir it in between sips, it eventually dissolves. Thank you for sharing this! I am looking forward to trying this and I'm going to see if my son will drink it too. He has several digestive issues including a conic autoimmune disorder called eosinophilic esophagitis and this may be helpful in addition to his medication in soothing the pain. Also, I would like to say that I appreciate advice more when it comes from someone who appears to have received all the benefits of the elixir they are describing. It wouldn't seem right if you drink it every day and yet had skin problems, weight issues, or digestive issues! :) I see this too often and it is a little discouraging when looking for effective natural remedies. I made my first mix today and thought it was really good! I will be back to report my take on if it helps my chronic heartburn. I also am working on loosing some weight, so I hope this will help this along, too. I made my first batch of this today and it was really good! I will report back soon as to if it actually helps my chronic heartburn and attempt at weight loss. I am trying this now using what I had on hand; regular ACV, a packet of Susta, apple juice, and I used cinnamon oil so it would mix better. I only used one cup of water as that is all my glass would hold. Strong vinegar taste but it is less by 1/2 cup water and the vinegar is just store brand. This sounds great. I have doing ACV in water with a little liquid stevia for a long time. I love cinnamon so it can only help. Important note: my research into cinnamon revealed that the stuff that is usually sold as cinnamon is cassia, a cheaper substitute that tastes similarly. If you want real cinnamon go for the organic stuff from Ceylon. It is pricy but worth it if you want the medicinal properties of real cinnamon.